According to a recent ABI Research report titled BLE Tags: The Location of Things (LOT), BLE beacons are proliferating at a great rate, with beacon hardware shipments predicted to top 400 Million units in 2020, while breaking U.S. $1 Billion in revenue. One of the major driving factors behind this is the huge demand among brands to leverage customer context to orchestrate brand experiences that drive unprecedented levels of engagement. As a result beacons are fast changing from being a mere retail buzzword to a technology that businesses across various verticals are busy trying to integrate with their marketing strategy. However, even with a good number of consumers having opted in to receive beacon-enabled notifications, sometimes it can be challenging to think of creative and conversion focused iBeacon campaigns to run. If you too are just getting started with your beacon pilot, check out our recent webinar on ‘Your Guide to Planning a Successful Beacon Pilot’. It will help you understand the nuances of setting up a beacon pilot from scratch and set you up for success. To help you come up with some ideas, we’ve assembled six iBeacon campaign ideas that you can take inspiration from and put to use in your business today. Today, it has become increasingly critical for brands to be able to meet the hyper-connected consumers on their terms, across all channels of interaction, by offering a seamless online-to-offline experience . This is where beacons come into the picture. These proximity detection devices provide brands with deeper insights on their customer base, allowing them to match their consumers with the right message at the right place, at the right time. A good example of this would be how Nordstrom, a retailer based in Seattle, looking to use iBeacon technology to change that fragmented shopping experience for the better. For example, once a customer has placed certain items in her mobile shopping bag, she can opt in to receive near-store notifications to receive a message as she passes by a Nordstrom store, if an item in her shopping bag is in stock. This is enabled by a beacon placed at the entrance of the store. According to a new research from Accent Marketing, half of more than 1,000 consumers surveyed said they would buy wearable tech so brands can send alerts and have more insight into their lifestyle. Combine wearable tech, with sensor-driven element and its ability to collect data with iBeacon technology and you a have deadly marketing combo that provides you with an amazing opportunity to enhance customer experiences like never before. An opportunity that Cannes Lions International Festival 2015 didn’t want to miss out on either. Rosé Time, a new Apple Watch app created for this year’s Cannes Lions festival, used iBeacon technology to connect with festival attendees who had downloaded the app when they arrived at the designated Cannes Lions Beach VIP Area. As soon as they arrived, the attendees received a simple beacon-triggered notification : “Rosé Time?”. On tapping ‘yes’ on their watch face, a glass was dispatched to their location within minutes. One the greatest things about the app was that it was able to showcase how brands can leverage iBeacon technology to deliver exciting new personalized experiences rather than just pushing offers and discounts. These days, consumers’ decision to buy and interact with a brand is often based on the ability of the brand to reward them for the time and money spent. According to a joint report titled ‘Achieving Big Customer Loyalty in a Small Business World’ by Manta and BIA/Kelsey, 61% of brands reported that repeat customers drive more than half of their revenue, rather than the new ones. This is where beacons come into the picture. These proximity detection devices allow businesses to send the right message to their consumers at the right time by having a deeper understanding of their target audience’s behavior, demographics and actions effectively. As a part of their extensive loyalty platform, cosmetics store chain Sephora, recently leveraged beacons to send out birthday alerts to customers via the Sephora To Go app, reminding them to pick up a special package, which is complimentary with a purchase during their birthday month. The app also sends out updates to inform consumers when new trainings occur in-store. And lastly, it also sends out notifications on other perks available in-store. For example, if a consumer is standing near the Beauty Studio in-store, she will receive a message asking if she is interested in a mini-makeover service. The iBeacon trial run by Sephora at a few San Francisco stores was very successful with more than 80% of Sephora shoppers opting in. 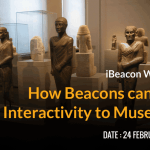 Beacons offer one of the best ways to allow visitors to experience hyper-localized stories about a lost world at museums. This can be done by employing an app that leverages beacons and geo-location technology, to empower visitors to design their own tour, by automatically detecting their location and presenting relevant information about the surroundings. The National Baseball Hall of Fame and Museum recently launched a new mobile app dubbed ‘The Beacon’ that leverages iBeacon technology to gives users a virtual tour of the museum in Cooperstown, N.Y. The app uses location to provide users with the importance of the location in the history of baseball and details of the event, while spotlighting key anniversaries and historic events in major metropolitan areas known for baseball. The BHOF Beacon app also allows users to create road trips, take curated trips and gain points for visiting locations. Every time someone checks in to every spot on a road trip, he or she will receive a virtual pennant. These points can then be redeemed at the Hall of Fame Museum for perks such as discounts on food, beverages, accommodations and other activities. While online shopping is convenient, between shipping costs and shipping times, it isn’t always ideal. This is where In-store pickup comes in handy. It allows consumers to place an order from the comforts of a home, avoid shipping costs, and get their item in minutes without looking through the store. However, even then, many a times consumers have to queue behind other shoppers when they arrive in-store, before being called over the PA system once their order is ready. With beacons, brands can now use geofencing to keep a customer’s order ready just before they arrive when they opt for in-store pickup. This is exactly what Woolworths, a supermarket giant is looking to offer with iBeacon technology. Late last year, Woolworths kicked off a beacon trial at the Norwest Circa Woolworths store in Sydney, by asking their consumers to download a dedicated mobile app in order to access the click-and-collect service. The app was directly connected to the in-store systems, thus ensuring that in-store staff were notified about a consumer’s order and proximity to the store. As a part of this campaign, when a consumer who has placed a click-and-collect order comes within the radius of the store, a notification is sent to Woolworths’ picking systems, prompting the in-store staff to start completing the order. Once the order is ready, a push notification is triggered via the app to the consumer, informing him or her about his or her order being ready. The success of the trial, has encouraged Woolworths to rollout beacon across all of its 254 click-and-collect stores. Gone are the days when merely providing your consumers with 24×7 access to information gave you the edge above your competitors. Travelers today expect their favorite travel brands to deliver instant information and services, based on their contextual needs, at all times. This is where beacons come into the picture. New York City’s John F. Kennedy International Airport recently launched an entire system at its largest terminal, Terminal 4, to track the location of travelers’ phones in order to measure wait times at security checkpoints, customs areas and even the taxi queue. The tracking system monitors Wi-Fi and Bluetooth signals from smartphones, via beacons that are strategically placed across the terminal. With this beacon deployment, the airport authority JFKIAT, aims to take away anxiety by broadcasting the wait times on monitors, based on which passengers can plan better. The monitoring system can also help analyze passenger movements thus helping with identification of congested areas. This provides management staff with the ability to ultimately reduce processing times in security and customs lines. Have you come across any other interesting iBeacon campaign ideas? Let us know in the comments below. In case you are planning a beacon pilot, take a look at Beaconstac, that includes everything you need to get started. Using Beaconstac you can set up your own campaign, without a developer’s help!